If you feel anything like I did, the last thing you want to try is natural deodorant. I am one who wears clinical protection deodorant everyday and am very self-conscious about smelling bad. I have tried all sorts of different store bought "all-natural" deodorants only to be very disappointed with the results. I can honestly say I have found a natural deodorant recipe that has changed that. 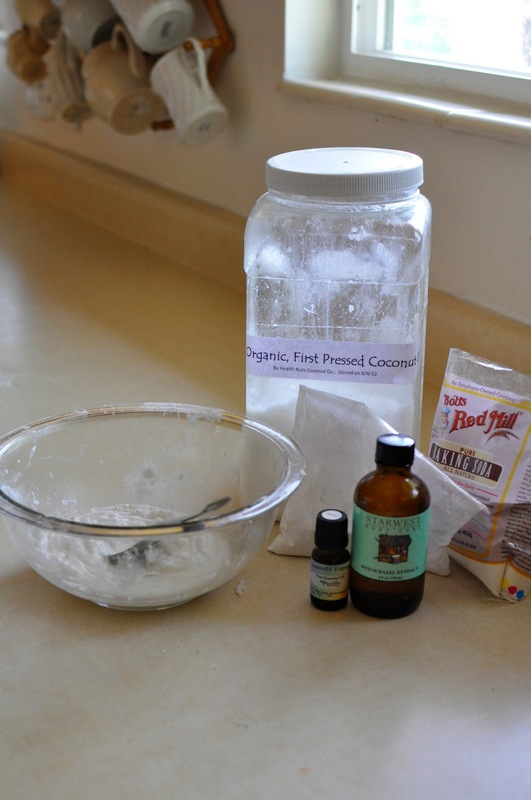 I started off with a base recipe found at one of my favorite blogs, Wellness Mama. If you haven't checked out her blog, you should. You can spend weeks reading her helpful blogs. Her deodorant recipe had so many positive reviews, I decided it was worth a try. I did add a few tweaks after reading some of the comments. I decreased the amount of baking soda to prevent irritation and added witch hazel to soothe, heal and keep the armpit dry. I tested the deodorant in two situations that I sweat the most. Test one included hot conditions and exertion. I tried it on a Saturday, knowing I would be spending the day in the heat weeding my garden. I was so impressed that at the end of the day, my armpits were still dry and smelled wonderful. Test two involved social anxiety...I applied it the next day, knowing that I would be speaking in church. I usually sweat the most when I am nervous. By the end of the day my armpits were still sweet smelling and my arms only got slightly moist when I was nervous (nothing like normal with the clinical versions) and quickly dried. I was also wearing a tight undershirt that always makes me sweat really bad....but not this time. It feels great on too. I was worried it would be greasy and drip onto my clothes. It is completely absorbed into the armpit. It only leaves a light residue. It is amazing that this natural deodorant actually works better than store bought, high strength clinical versions. Not only does it work better, but the ingredients are so natural that you could eat it...although I DO NOT recommend that. If you think about it though, if you wouldn't ingest it, why would you smear it into a delicate area like your armpits everyday? Mix all ingredients until a smooth consistency is reached. Store in empty baby food jars or small mason jars. Makes enough to fill two baby food jars. Apply with hands after showering. Combine all ingredients with a pastry mixer. Finish mixing with a spoon. The final consistency should look like this. ***An update: When making the switch to natural deodorants there is a transition period while the harmful chemicals from your store bought deodorants are coming out of your skin. You may find that you temporarily sweat more or break out a little in your armpits (it should be painless, if you break out in a rash, discontinue use until the rash is healed and read the advice below.) After the adjustment period, you will actually sweat less than you did before because your sweat glands are no longer clogged and don't have to overproduce sweat to compensate. Remember that sweat is your body's natural detoxing and cooling method. Why mess with God's design, He's way smarter than us! I know that culturally we have issues with sweating. But don't worry, your sweat glands will adjust and you will find a happy medium. And even better, you won't smell at all! Most importantly though, you won't be putting harmful chemicals on your body anymore. That is so worth it! With that said, I have been using this deodorant with fantastic results for two months now and it is still working wonders. In fact, it is so effective, I can usually go 2 days before needing to reapply! There are a few things I have learned in the process though. Because baking soda is very base, it can cause a little irritation after prolonged use (this irritation is not to be confused with the initial detoxing period which occurs when you first switch over.) This is easily remedied by first putting on a very thin layer of jojoba oil and then applying the deodorant. I began to get some irritation to the point that I had to discontinue use of the deodorant. After I learned of this trick, I am back to wearing the deodorant with absolutely no issues whatsoever and it's still just as effective. If you have tried this trick and it doesn't take care of the irritation, I found another non-irritating formula that works. It is not as strong, and I found I did have to reapply on really hot days in the sun. 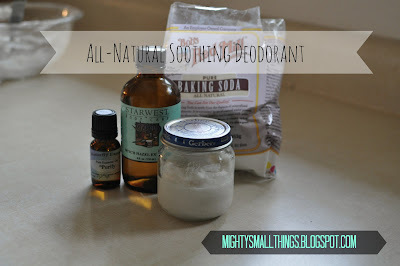 But, I promise, it's the most effective baking soda free homemade deodorant you'll find. Have any questions or fabulous results? Tell me about it in the comment section.